Updated Sunday July 15, 2018 by Chief Information Officer. 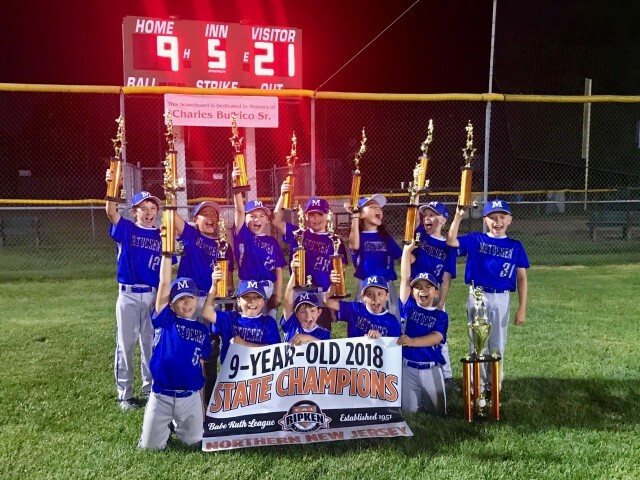 Congratulations to the Metuchen 9U team for bringing the Cal Ripken State Championship banner home to Metuchen. The team was undefeated in the state tournament with wins over Roxbury, Summit, Millburn, South Plainfield and finally Bridgewater. The boys had to overcome a 2-0 deficit in the bottom of the 6th inning to defeat South Plainfield in the first playoff game but never gave up. Their bats finally broke through and the game ended with a thrilling walk-off hit to advance to the championship game against Bridgewater. Bridgewater was the odds-on favorite going into the tournament and beat most teams they faced with mercy rule victories during the tournament. The boys turned the tables on Bridgewater, took a big early lead and rode it to a mercy rule 21-9 win in 5 innings. The team now advances to the Mid-Atlantic Regional Tournament where they will face other state champions from Delaware, Maryland, Pennsylvania and New York.